Careful diagnosis of Upper back and lung pain is essential - never ignore upper back pain if you have a lung condition, a history of same in your family, or if you feel short of breath. 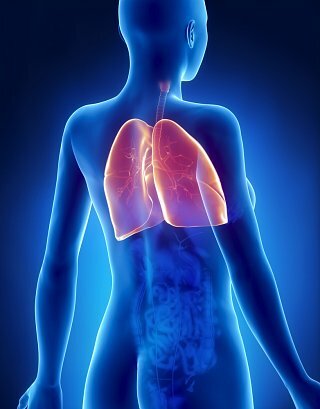 When a client comes to me with upper back pain and I sometimes notice a chest infection or, with the help of their doctor, we discover something more serious in their lungs. The most important thing I would say is Never ignore upper back pain if you have a lung condition, a history of lung conditions in your family, or if you feel short of breath and are coughing. It may be down to a simple chest infection, but it is better to get it looked at by your doctor. Having said that, let’s look a bit further into the possible connections between back pain and the lungs…. What is the connection between upper back and lung pain? Your lungs lie in your upper back area and so problem in your lung can easily refer directly to the muscles in your upper back. Lung problems can also be recognised when your upper back pain is associated with breathing or coughing. During a bad chest infection it is quite common that you will feel pain in your upper back when at rest, or when you are deep breathing or coughing. This can be due to a mechanical cause where your muscles in your upper back are put under excess strain from coughing - resulting in upper back or inter-rib pain. This presentation may respond well to mechanical treatment without medication, but you must seek medical advice on this immediately in order to reduce the risks of further damage to your lungs or spine. Alternatively, the lung itself can refer pain to your upper back area. This can be present in mild to moderate chest infections, but it can also be a sign of more serious chest conditions. Sometimes, upper back pain that is related to lung problems is not affected directly by movement. When you twist your spine - and it does not increase your upper back pain - treat this as a warning sign. Go to your doctor and have yourself examined thoroughly. An underlying chest infection may be present. Upper back pain not associated with movement can still arise from your spine and its muscles. However, the only way you can be sure of the causes of your upper back pain, is to seek medical advice. Do not wait until your symptoms become very bad - early intervention will help you to avoid serious lung and upper back problems. Finally, if your upper back pain is only associated with deep breathing and coughing, it is likely to arise from your lungs and warrants medical attention. Again, best to visit your doctor or physician to get it checked out.